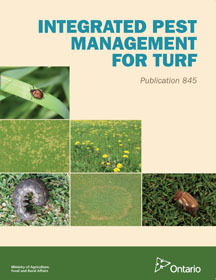 Turf management has come a long way from the days when a manager would stick a spade in the ground and turn up the sod to examine turf and soil conditions. While fundamental observation skills, experience and intuition are still essential components of the profession, modern day turf managers have a much greater array of tools to monitor turf systems and inform critical management decisions. Let’s take a look at three examples of instruments that may merit a place in your decision-making toolbox. Not that many years ago, electronic devices used to measure soil moisture rarely were seen outside of turfgrass research plots. 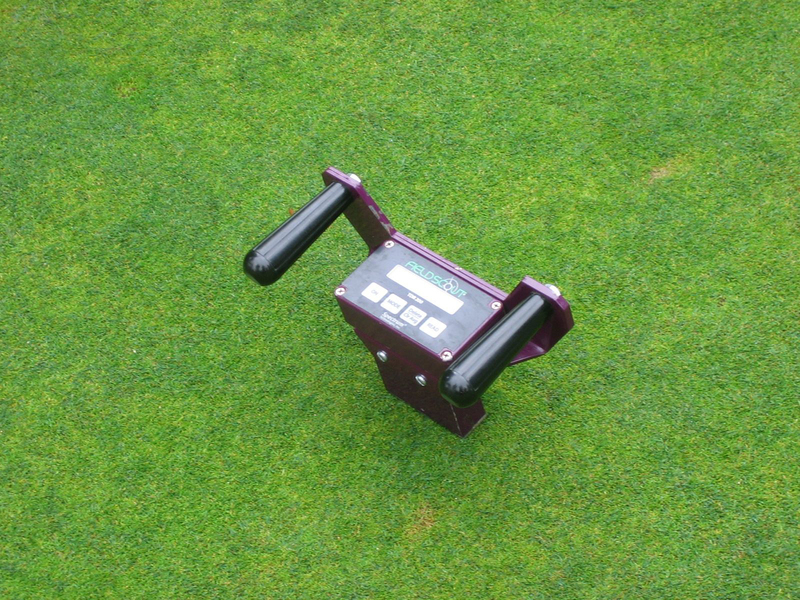 Over the past decade, hand held TDR probes have become almost essential tools for the management of high intensity use turf areas like sports fields and putting greens. They provide soil moisture information that can be used to make irrigation decisions and audit irrigation system performance quickly and accurately. TDR stands for time domain reflectometry and works from the basic premise that the more moisture there is in a soil, the faster an electrical impulse will move through it. When selecting and using a TDR probe to manage soil moisture, it is critical to have probe lengths that measure moisture within the depth of soil containing the majority of turf roots. It is also important to realize that the measurement is only made in the vicinity of the probes – a systematic approach with multiple measurements is needed to gain an overall picture of the moisture conditions on an expanse of turf. Here is a video from TPC Sawgrass Agronomy that describes how they use their TDR probe to manage soil moisture on greens for the PGA Tour’s Players Championship. Fieldscout TDR probe for measuring soil moisture content. Double ring infiltrometers are the standard tool used to measure the rate at which water enters (infiltrates) a surface like a putting green or sports field. Knowing the infiltration rate allows you to schedule irrigation more effectively to insure applied water enters the soil and does not run off to adjacent areas. 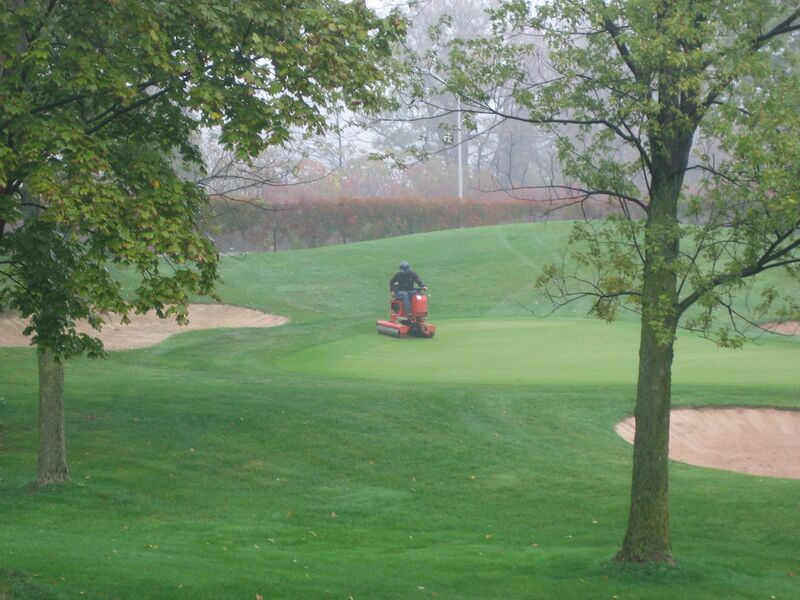 It also helps you assess the impact of various cultural practices like shallow and deep tine aerating, or the application of wetting agents, on the movement of water into turf areas and through the soil profile. Double ring infiltrometers work by having two open ended cylinders that are pressed into the soil. The smaller inner cylinder contains a float with a measuring rod attached. The outer cylinder helps eliminate error from water moving laterally in the soil during the test. Water is added to both cylinders, a float and timer are used to measure the infiltration rate (cm/hour). While a number of double ring infiltrometers are available commercially, if you are handy you could easily rig up a basic infiltrometer using a couple of different sized cans, a ruler and the stopwatch on your smartphone. Here is an example of a basic double ring infiltrometer courtesy of the Food and Agriculture Organization of the United Nations. A variety of instruments are available for testing surface hardness of which the most well known is the Clegg Hammer. This instrument measures the deceleration of a free falling weight as it hits a surface that is a measure of the ability of the surface to absorb energy from falls or balls. Surface hardness is particularly important on sports field surfaces. The greater the ability of the surface to absorb shock energy, the less of the shock energy will be absorbed by a falling athlete’s body. Monitoring surface hardness allows turf managers to make decisions regarding practices on natural fields that alleviate hardness, most notably core aeration. The device is also useful for measuring changes in the surface hardness of synthetic fields over time. 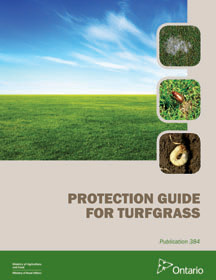 Surface hardness is also a factor in the playability of many other sports turf surfaces including golf greens, cricket pitches and tennis courts. Here is a link to a short video showing a Clegg Hammer in use. The following two devices are examples of the expanding array of high tech instruments that may have a future role in the turf managers toolbox. The Sphero Turf Research App that claims to be able to use a smartphone controlled ball to simultaneously measure a variety of turf surface characteristics. Aerial drones have been in the news recently for a variety of reasons from package delivery to privacy issues. Drones have also been used to create flyover videos for golf course websites. Greensight Agronomics adds an imager and software processor that provides whole property management insights through daily flyovers of the entire course. Do you see yourself maneuvering a remote controlled ball around your greens or flying your property with drone-mounted sensors in the future? Do you have a favourite turf tool that has not been mentioned? Let us know in the comments below. It has been nice to feel the weather signaling the return of spring with some sunny days and above freezing temperatures following a long, frigid January and February. 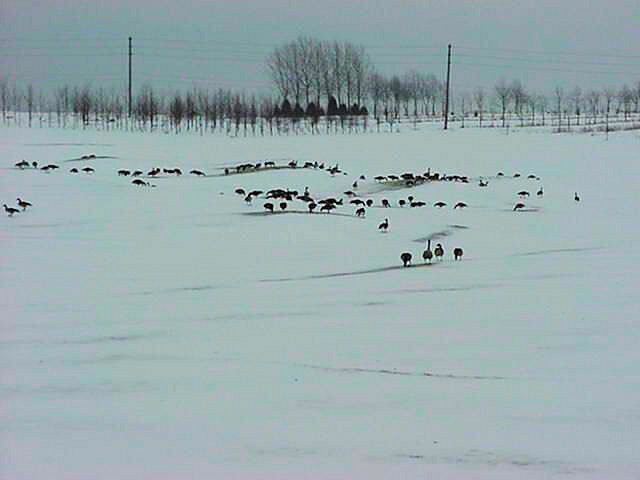 One of the first signs of spring at the GTI is the return of the geese feeding turf as it emerges from the snow. 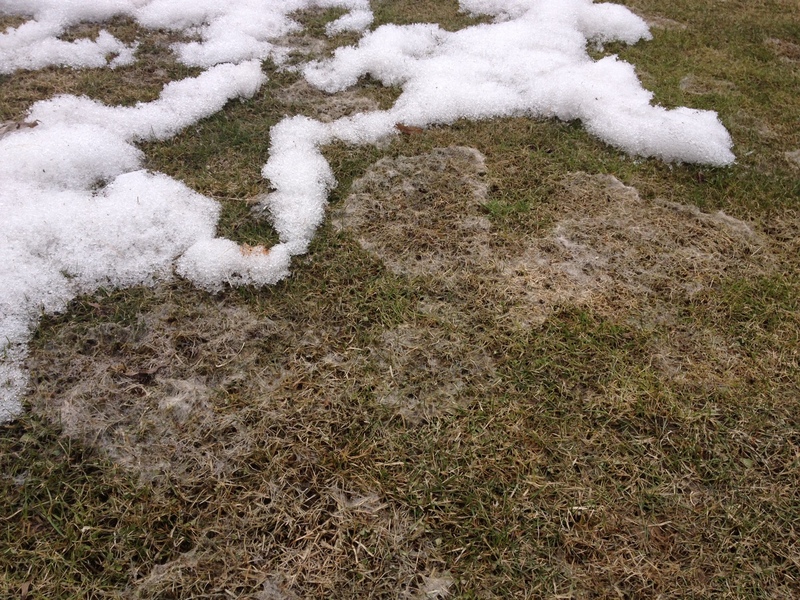 Reports from the field indicate that some areas have experienced ice cover since January and potential turf damage has been detected on some properties. In the Guelph area there is a thin ice layer that is mostly confined to low mown areas such as tees and putting greens. The weather forecast calls for colder temperatures later this week with mixed precipitation and a continued warming trend the following week. Due to the unpredictability of the weather, the decision whether or not to remove snow and ice can be difficult. If you have not done so already, consider taking some turf plugs from problem areas that have suffered winter damage in the past. Place them in a warm, sunny window where you can keep them moist and observe any potential damage. You can also use your nose to detect death, as damaged plugs will emit the foul, rotting odour produced by the anaerobic conditions under ice. Hopefully all of your samples smell sweet and healthy. Snow removal is generally recommended only in situations where you have an ice layer you want to remove. If you make the decision to remove snow from greens to facilitate ice removal, consider the time and labour requirements as well as availability of proper equipment. If you do not have previous experience with removal of snow from turf, test any equipment you are using on an out of the way site to insure it is set up properly to prevent turf damage, your operators are properly trained and collect data to help estimate how long it will take you to clear all greens. 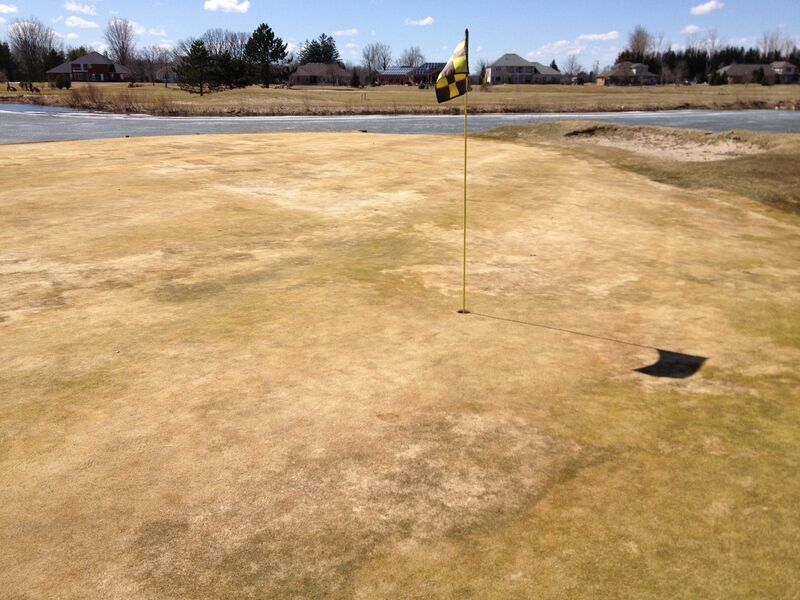 There are few experiences worse than having spring damage on greens caused by human intervention and not ice. Ice melting can be hastened by spreading dark coloured materials on the ice surface to help transfer the sun’s heat to melt the ice. Dark fertilizers, dyed black sand and even black sunflower seeds have been used effectively. Remove snow around greens to create drainage channels that will allow melt water to drain from the turf surface to surrounding areas. This is helpful even where ice is not an issue as melt water can pool and refreeze on green surfaces causing turf damage as the plants lose their winter hardiness during the spring thaw. Watch for the creation of “collar dams” that cause water to gather where the green surface meets the collar. You may need to carve a pathway for the melt water to move through the collar away from the green. Please share any comments from your own experiences and observations as well as burning questions or suggestions for content to include in future ONTurf blog postings.